United States currency is made out of paper that consists of 75 percent cotton and 25 percent linen. Although the currency is pretty strong, it’s still paper, and can be torn or damaged. If you accidentally tear some money, you don’t have to just take the loss. Currency can often be replaced. 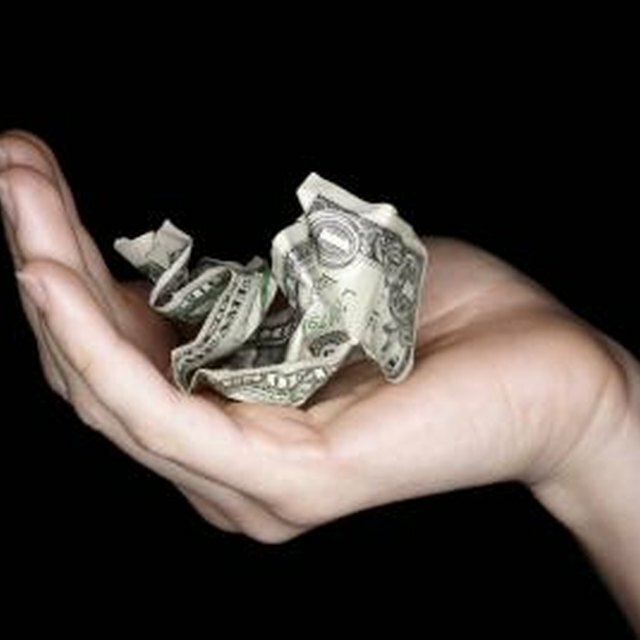 The way you can redeem ruined cash or swap it for new bills depends on how badly damaged it is. When part of a bill is torn off, hang on to the pieces. If other damage doesn’t make the money illegible and you have more than half of the original note, take it to a bank and swap it for money that’s in good condition. Don’t worry if a torn bill is also worn or dirty. As long as you have most of it and the bank teller can tell it is U.S currency and what the denomination is, the bank can accept it. The U.S. Bureau of Engraving and Printing defines “mutilated currency” as a note that isn’t readily legible except by close examination or that is not clearly more than half of the original bill. The most common causes of damage, aside from simple wear and tear, include water, fire and chemicals. If you aren’t able to switch out torn money at a bank, the Bureau’s Office of Financial Management may be able to redeem it and reimburse you. You’ll need to send the torn money to the Bureau. The office will inspect it and pay you the value of the mutilated cash if it is redeemable. Don’t just stuff ruined money in an envelope and mail it off. The U.S. Bureau of Engraving and Printing advises individuals to pack currency in cotton and wrap it in plastic. Try to leave brittle or worn fragments as they are, without rearranging them. If mutilated notes are rolled up or stuck together, leave them that way. The idea is to prevent any more damage so the Bureau people will have a better chance of identifying the currency and determining that they can redeem it for you. Which Branch of the Government Controls the Coining of Money? Write a letter explaining how the currency got damaged and send it with the package of money. Include your banking information if you want payment by electronic funds transfer or your mailing address if you prefer a check. Send the package by registered and insured mail and ask the shipper for a return receipt. Mail the damaged money to the Bureau of Engraving and Printing, MCD/OFM, Room 344A, 14th and C Streets SW, Washington, DC, 20228. If you are using the Post Office, the address is P.O. Box 37048, Washington DC, 20013. For a private carrier like UPS, the mailing address is 14th and C Streets SW, Washington DC, 20238.